This research analyses the right of highly skilled refugees to decent work in The Netherlands. Considering human capital and knowledge economy theories, it explains labour market segmentation, the precarity of refugees and the labour market integration of refugees. It investigates whether refugees find work in their areas and levels of expertise. It also explores how they find work, factors that influence this process and their definition of decent work. The aim is to contribute to existing knowledge on the employment situation of highly qualified refugees in relation to ideas of ‘decent work’. 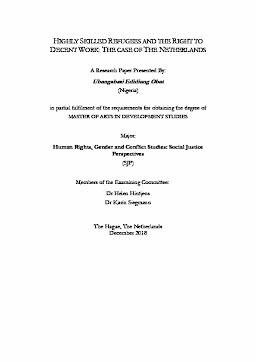 This study focuses specifically on the views of ten highly skilled refugees on their employment in The Netherlands. I was interested in their efforts to find decent work that fit their fields of expertise and at the levels of income that reflect their ideas about where in the employment ladder they ought to be. To supplement interviews with refugees, five additional interviews were conducted with representatives of organisations involved in issues of employment for refugees. These included Non-Government Organizations (NGO’s) and public sector organisations. The main findings were that highly skilled refugees generally did not find work that matched their highly skilled background. Respondents felt this was in part because of both structural and social discrimination. Revealingly, one Dutch informant referred to the existence of a ‘Dutch working culture’ to explain this exclusion. Surprisingly, validation procedures were not a significant part of these refugees’ experience. Another finding was that ‘volunteering’ as a concept seemed to be offered to these highly skilled refugees, and was one they did not feel attracted by, given their costs and family obligations. This study advocates for the recognition and implementation of decent work for highly skilled refugees as a human right.